Visual Pharmacy Plus™ is a fully integrated, real-time, prescription processing software that provides today's retail pharmacies all the tools necessary to handle the complexities of modern prescription processing. The system offers a high degree of functionality combined with an easy-to-use graphical interface. Whether you fill 50 or 5,000 prescriptions a day, the AbacusRx Visual Pharmacy Plus™ software handles it with ease. A key feature is a highly centralized prescription processing platform. The system is designed primarily around the prescription fill screen. Functions such as filling prescriptions, adding patients and doctors, transmitting online claims, performing proactive DUR analysis, maintaining SIGs, and printing patient education leaflets can all be done while filling a prescription. 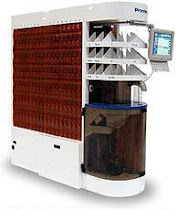 This centralized design greatly improves the user's productivity by providing direct access to most of the tasks associated with prescription processing from a centralized processing screen.